Said it before and we’ll say it again: we’re getting hard to impress. Snobbery? Maybe. Increasingly high standards? More likely. You see, there are a lot of good bloody marys. The kind you sip at brunch or a tailgate that are perfectly tasty but not something you’d gush about in your diary later. Every so often though, a bloody mary blows your mind when you least expect it. First things first: it’s made in Chicago, Lincoln Park to be precise, giving it a homecourt advantage. Second, it’s straight-up legit inside and out. It stays true to its mantra, handcrafted in small batches with the finest, all natural ingredients. 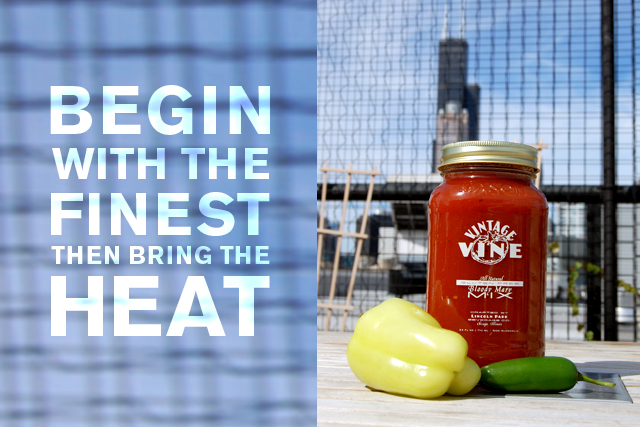 It makes a seriously fresh tasting bloody mary that you wouldn’t expect to find in a bottle, err, jar. While we’re on the subject, let’s talk about the ridiculously cute Mason jar packaging. The sustainability is a win in our books because we can reuse the jar for leftovers or infusing vodka. Back to the taste. This isn’t a bloody mary mix that tries too hard to be clever. Vintage Vine is so well made, it doesn’t need to be. Tomato is the predominant flavor, much like the original inventor of the cocktail likely intended. Next comes a spiciness that’s not for amateurs. It packs a hot pepper punch, not surprising considering the #2 ingredient is hot sauce. And it sure sneaks up on you. Not that we’re complaining. We love a little pain. Of course, other standard ingredients dance together in this mix—steak sauce, Worcestershire, horseradish, garlic, to name a few. 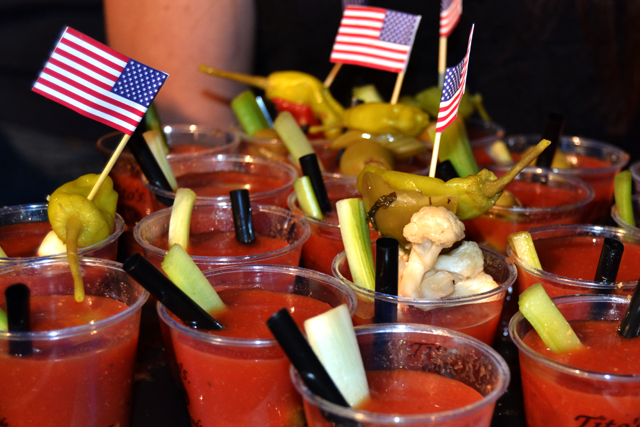 Together, it created a perfectly balanced, spicy, fresh bloody mary that we mixed with Absolut vodka. We added nothing else. Following this mix’s rule, we thought simple was better and garnished only with a lemon wedge. We wouldn’t mind seeing Vintage Vine as the house mix at local bars and restaurants (ah hem, anyone taking notes?). Until then, find the mixes on the Vintage Vine website or at these locations. 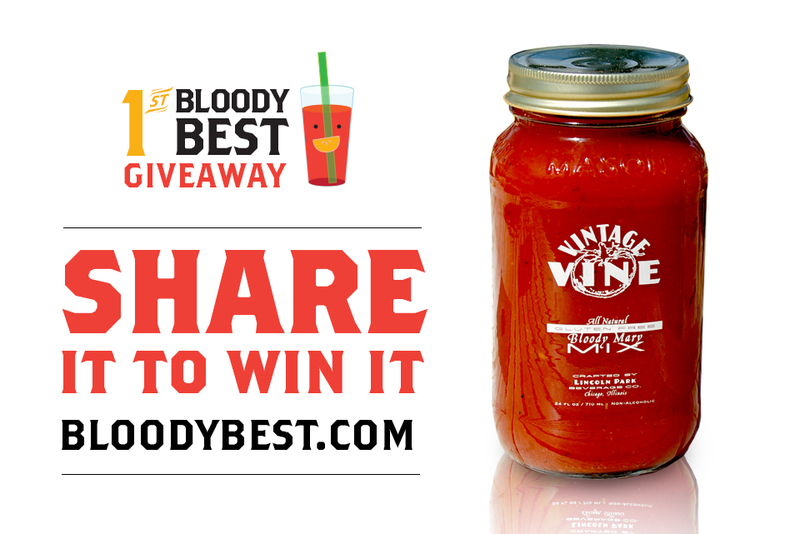 We loved Vintage Vine bloody mary mix so much, we’ve partnered with them to give one away to four of our readers! 1. 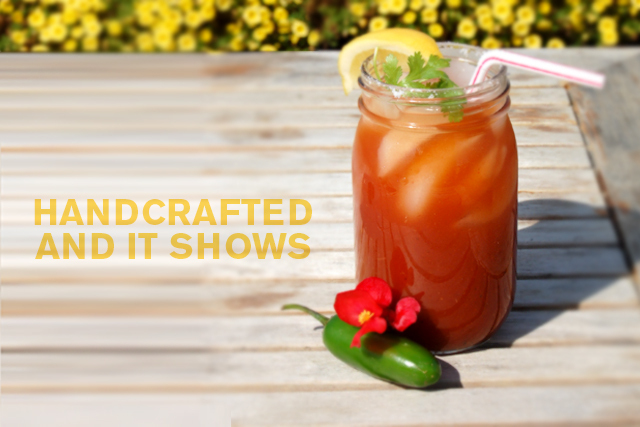 Name your favorite bloody mary mix in the comments of this post. 2. Like us on Facebook or follow us on Twitter and share this giveaway pic! Be sure to tag us so we know you entered! Enter by midnight Saturday, October 19. Winners will be chosen at random with Random.org. Open to people 21 years and older in the contiguous U. S. only. *Products were complimentary. Opinions and photography are our own.